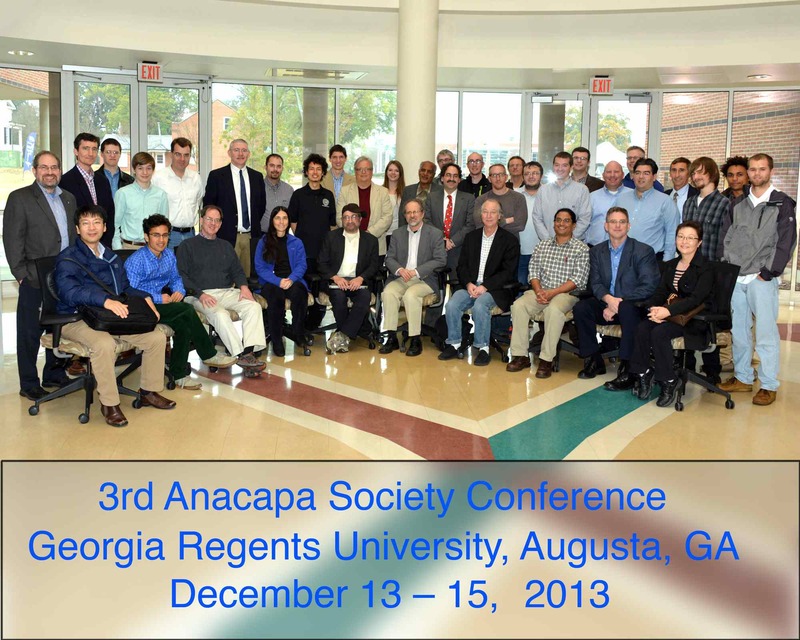 The 3rd regional meeting of the Anacapa Society was held December 13-15 at Georgia Regents University (GRU). Superbly organized by Prof. Trinanjan Datta (GRU), the conference saw some three dozen participants gather for three days. The conference schedule focused on research talks, but also included additional sessions on professional issues for theorists at undergraduate institutions, along with discussions aimed towards shaping the future direction of the Anacapa Society. Prof. Datta was aided by organizing committee members Prof. Javier Hasbun (U. of West Georgia), Prof. Chris Fragile (College of Charleston), and Prof. Mark Edwards (Georgia Southern U.). The meeting featured a keynote lecture by Prof. Charles Hanna, Physics Department chair at Boise State University, reflecting on a career in theoretical and computational research, and how that intertwined with the growth of the Physics Department at Boise State. In addition, Dr. Richard Weiner of Research Corporation led an excellent session on the keys to navigating the grant process successfully. The conference showcased the real opportunities available to theoretical physicists at undergraduate institutions to push their subfields forward, and the value that they add to their institutions as scholars and mentors (both to students and colleagues). Conference participants found the cross-fertilization made possible by the range of research talks especially valuable. Talks covered topics from calculating astrophysical signals of new fundamental physics to the modeling of systems of ultra-cold atoms, from questions of information in classical and quantum physics to new techniques in processing data from seismic arrays. In addition, the conference examined ways that theoretical physicists situate their work in cross-disciplinary contexts, and that they can benefit from and contribute to the insights of those who study the framework of science. Other talks demonstrated the impact their department-building efforts have had in incorporating new communitities into their colleges. The Anacapa Society was founded in 2007. In 2009, at an NSF-funded workshop, the Anacapa Society determined it should have regular regional meetings. This has led to a West Coast meeting in 2010 and a Midwest meeting in 2012, prior to this recent Southeast meeting. Thanks to the Organizing Committee, Georgia Regents University, and especially to Dr. Trinanjan Datta!